The Canada Caregiver Credit (CCC), new in 2017, is still poorly understood and a complicated tax break to explain. For these reasons, many Canadians have missed claiming it. Tax and financial advisors who really want to help families under medical stress can make a big financial difference will add it to their year-end review and adjust 2017 tax returns for missed claims. A “Maxi” CCC of $6883 in 2017 ($6986 in 2018), or a portion thereof, may be claimed if you are supporting a spouse or eligible dependant over 18, whose net income is over $11,635 in 2017 ($11,809 in 2018). You may also claim this amount for infirm adults who are considered “other dependants.” But this larger credit is never claimed for a minor child. The Maxi portion of the Canada Caregiver Credit is complicated for spouses because you may be able to claim the Mini CCC in conjunction with the spousal amount. However, if you can’t claim the spousal amount then you may be able to claim part (or all) of the Maxi amount. A dependant can also be your own parents/grandparents, brothers/sisters, aunts/uncles, nieces/nephews or adult children, or those of your spouse or common law partner. Only one claim will be allowed for the Canada Caregiver Credit for this class of dependant, although the claim could be shared among two or more taxpayers as long as the total amount claimed does not exceed the allowable claim. CRA may contact your client sometime in the future to verify the claim for the Canada Caregiver Credit or the Disability Amount. An infirm dependant is one who has “an impairment in physical or mental functions.” A child under 18 will be considered to be “infirm” only if he or she is likely to be, for an indefinite duration, dependant on others for significantly more assistance in attending to personal needs, compared to children of the same age. This person can be claimed for the Canada Caregiver Credit. Finally, don’t forget that the EI Compassionate Care Benefits For Caregivers are available for up to 6 months. 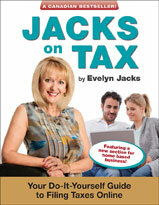 Excerpted from Evelyn Jacks’ Essential Tax Facts – How to Make the Right Tax Moves and Be Audit-proof Too. Purchase it online today, with no shipping costs! Next Next post: Newcomers Need Advice: Can You Explain Our Complex Tax System?